Do you think social media tools will replace email at work? The National Stock Exchange is known to have a state of the art trading system. It has an up time record of 99.99 percent and processes more then 450+ million messages every day with sub millisecond response time. The exchange has been continuously undertaking capacity enhancement measures, to effectively meet the requirements of increased users and associated transaction loads. Today, NSE has 200,000+ terminals spread across more than 2000+ towns/cities across the country. Mr. Umesh Jain, Chief Technology Officer, NSE, gives his perspective below. Q: What are the dynamics shaping your Industry? Q: In the National Stock Exchange, what are your real IT headaches? And what are your peers in the Industry confronted with? Secondly one has to ensure 100 percent availability which is very different from other organizations and we are fully committed to ensuring that . Any blip in operations of a major exchange like NSE can have major impact on market movements, which in turn can cascade into bigger system issues for the economy. Q: Out of these IT Headaches, which are really acute and how do you plan to address them in short term & near term? A: There are firm plans for all opportunities and challenges short, medium and long term plans. However due to confidentiality reasons I cannot share the same with media. Q: We constantly hear about IT Operations being shaped by cloud, social, mobile &analytics. In your operations, which of these are in order of priority for your organization and why? A: Analytics and cloud are more directly relevant. Both create huge opportunities for the exchange in terms of informed decision making as also bringing down the cost of transaction. 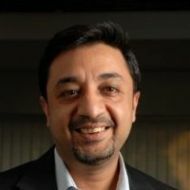 Q: As a CIO, does the Cloud model really make sense for India Inc according to you? If so, which are the best cloud models according to you? Q: What is the technology foundation (virtualization, storage, networks, access, etc) that is necessary to leverage the Cloud model? A: All. Again to each his own depending on the model thats appropriate. Difficult to generalize. Q: Can cloud change the way business is being run fundamentally? A: Yes, other than the fact that you bring down the cost of running your business, depending on how much that factor issome offerings/products/services that were unviable earlier may become viable now. Further with cloud models, MSME/SMEs etc. can compete with larger players on level playing fields at least on commoditized technology components. With no or little sunk-in costs in cloud services (and people to manage it) they can pretty much focus on generating returns. Q: Is Cloud computing in your companys priority list in terms of importance? permission of moneycontrol.com is prohibited.